Alberta Premier Rachel Notley speaks at a news conference in Edmonton, on Aug. 30, 2018. 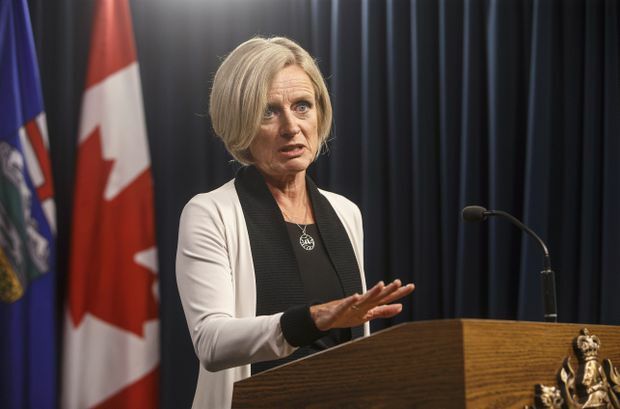 Alberta Premier Rachel Notley says the challenges facing the Trans Mountain pipeline expansion shows her province can do everything by the book and still get shortchanged. Ms. Notley says the recent Federal Court of Appeal decision quashing the expansion project has provoked frustration and anger in Alberta, but her government will continue to fight to get it built. She says without it, the continuing pipeline bottlenecks will continue to cost Canada $40-million a day in a discounted price for oil. “I know I speak for everyone here in this room and every Albertan in saying that we are frustrated and, let’s go with it, angry about the recent court decision on Trans Mountain,” Ms. Notley said at the official opening of Suncor’s new Fort Hills oil sands extraction site, north of Fort McMurray on Monday. The Appeal Court recently struck down the pipeline on the grounds the federal government did not consult properly with First Nations and did not take into account the impact of tanker traffic on marine life. The Trans Mountain project would double the existing line from Alberta to B.C. to triple the amount of oil shipped to the coast, allowing producers to sell to Pacific Rim markets and fetch a better price. The Alberta government says lack of pipeline access is forcing its producers to sell exclusively to the U.S. market at a substantial price reduction. Prime Minister Justin Trudeau says his government is considering all options to get the project restarted. Ms. Notley met with Mr. Trudeau last week in Edmonton and said he promised her a new timeline within weeks. Ottawa now owns the existing Trans Mountain line, purchasing it along with other assets recently for $4.5-billion to ensure the expansion gets completed. In the meantime, Ms. Notley has pulled Alberta out of the federal climate change program, which calls for escalating levies on carbon emissions. Ms. Notley has said getting Trans Mountain up and running was quid pro quo for Alberta signing on to the federal carbon program, and that Alberta will stay on the sidelines until the Trans Mountain problem is fixed. Alberta retains its own climate plan, which taxes carbon at $30 a tonne, but for now won’t increase it in 2021 to keep it in lockstep with the federal program.